The approach and business model of South Korean MMORPGs have reached almost all the genres in the mobile sector. "Free-to-play" has become the bedrock of the Android ecosystem. The videogame industry is constantly being strangled by outcries against its current business models. However, this doesn’t take away the fact that its toxic freemium systems have been the key to making the mobile leisure industry into the behemoth that it is today. But telling the story isn’t the same as living it, so I spent exactly one year playing Lineage 2 Revolution one of the most successful Free to Play MMORPGs in the world that’s still a top earner even today. The tricky part is that no one made me do this “study,” which leads me to some lesser-explored terrain, to talk about addictions and questionable game systems. 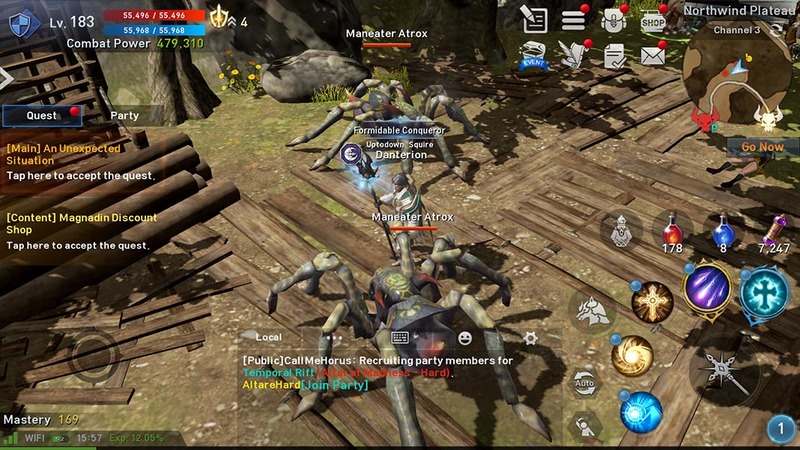 Although it was released initially in 2016 for the Asian market, the international version of Lineage 2 Revolution was released one year ago, in June 2017. 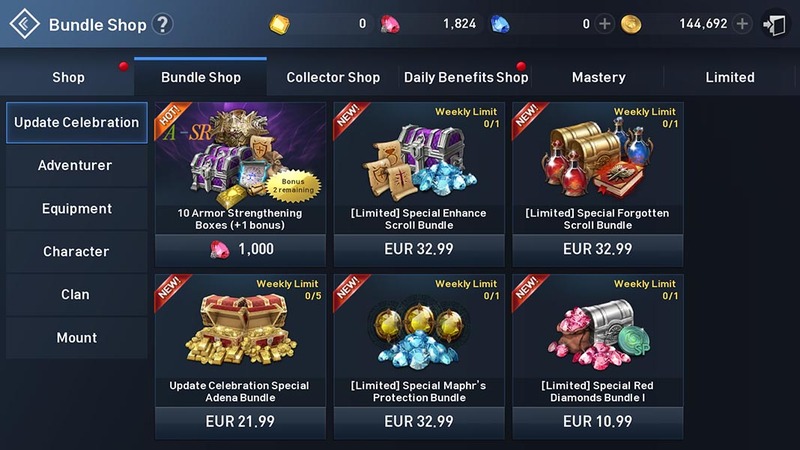 Yours truly, with rather ample experience analyzing MMORPGs, didn’t think much when I came across what I assumed was just another Korean freemium game requiring little interaction, a lot of repetition, automation of activities, while managing inventories and collecting various little stones. What I didn’t expect was that today, one year later, I’d still be playing. Lineage 2 Revolution is an adaptation of the successful MMORPG from NCSOFT, or at least one of them, since its development and distribution are taken care of by Netmarble, while the studio that created the original titles for PC followed suit with Lineage M, an adaptation of the first game of the saga with 2D isometric graphics. This one still hasn’t shown its face outside the Asian market, though. Although it’s been a few years since its release, both are still the most profitable games in countries like South Korea and Indonesia. To give you an idea, the revenue in Indonesia in the first trimester of 2018 surpassed $189 million. 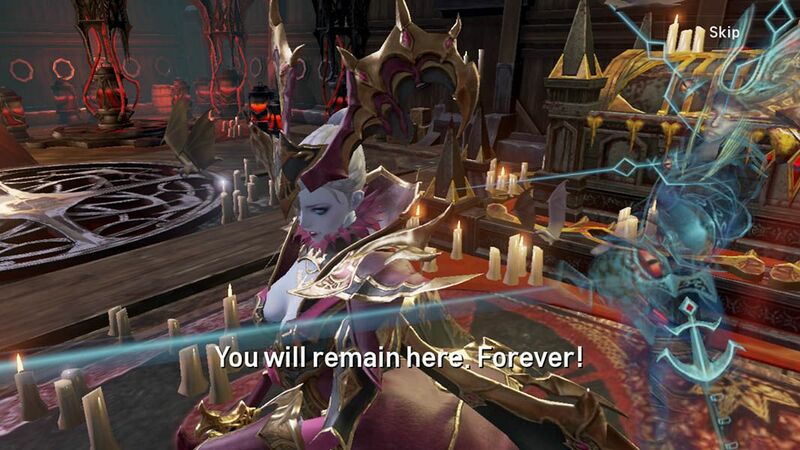 While Lineage 2 Revolution has surpassed one billion dollars in just its first year of existence. That said, anyone who’s dedicated a few hours of their adolescence to original PC titles will know the formula that has been immovable in the genre for eons, and that has shown up in almost every genre beyond online multiplayer role-playing games. Anything that’s considered an MMO comes with a series of vices and outdated mechanics up their sleeve. The freemium model is almost the only one that works on Android, a platform associated with mostly free apps as opposed to iOS (although that one’s been hopelessly dragged down the same rabbit hole, too). Proof of this is the recent announcement made by Square Enix Montreal to stop making Go games in favor of creating freemium games in the future. Previously, the company released Tomb Raider, Hitman, and Deus Ex for mobile devices following the traditional formula of one single payment to enjoy all the content. If they weren’t successful even with these big-name licenses, then something clearly isn’t working. It’s no coincidence that Nexon and Netmarble are both South Korean. Two of the most important mobile videogame developers follow a business model born in the country with the most gaming-addicted children in the world. A country that for years now has forced the servers of the main games that operate there to be deactivated for six hours at night so that the most addicted would at least sleep a little bit. In fact, the World Health Organization recently recognized videogame addiction as a mental illness, making special reference to the situation in South Korea, where half of young people between age 10 and 19 play videogames at least three hours per day. In a time when the use and abuse of so-called loot boxes have even been declared illegal in some countries, these gambling-like models are having their hay day on mobile devices. L2R and any other current MMO you can think of uses these systems of task repetition over and over again to get random rewards. The problem is that your chances of actually getting a big prize increases if you pay real money, which only magnifies an already deadly problem. Even so, we can clearly see the recurring smear campaigns against whatever game is trending at the moment. Right now the focus is on Fortnite, which, despite having half of the world hooked, takes a different, much more noble route, despite what they’d like us to believe. Back to Lineage, in all this time I’ve had plenty of “crises of faith” in players that dedicate endless hours to the game to escape their problems in the real world. The endless repetition of virtual activities ends up becoming intoxicating, as if these daily routines could make up for the unexpected ups and downs of real life. Even so, the scarce relations between players through the clans are the weak glue of this solitary enjoyment born in countries with an individualist society and terrible panic at the thought of failure at school or work. What the game represents is a safe haven for players, or at least one that’s safer than other videogames have provided. But if a pre-teen is spending all his father’s money while playing FUT, it’s a sign of a poor upbringing more than anything else. It’s time to take some responsibility here. But let’s get to the nitty gritty, shall we? L2R continues to be the traditional model of the genre that started out on PC. That is, it offers an enormous world with huge interconnected areas where you have to complete different missions as you level up and improve your equipment. 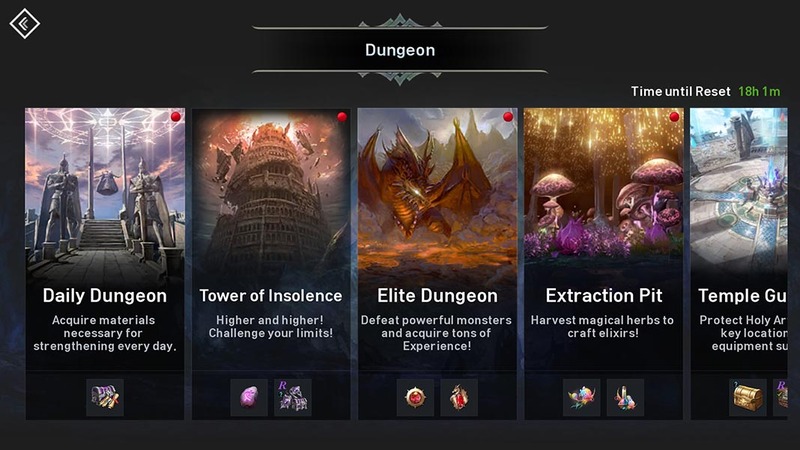 To make things a bit lighter for smartphones, a lot of the activities offered take place on independent maps outside the game’s world, like dungeons, sieges of fortresses, and PvP areas. Many of these events have a level requirement, so you have to complete all the possible tasks provided if you want to unlock new challenges. Ad infinitum. This progression is rationed down to the milimeter so that you have to access the game every single day and complete a series of tasks that you can only repeat after 24 hours have passed. Sound familiar? These tasks can include completing five combats in the arena, participating in a small raid, completing various enemy eliminations, or checking in in the clan hall. Earning all the available experience in one day could easily take a couple hours per day. But of course, without too much participation on your part. The key is that practically the entire control system is automatized. By default, your character moves automatically to the point where the mission needs to be completed, it’ll defeat the enemies with some assistance, and return to the starting point to get the reward. All you have to do is tap the accept button from time to time, meaning that you can practically advance in the game while constantly being AFK. One interesting example: the clans can activate the “fireplace” in their private hall, which grants you continuous experience for the mere fact of having your character there. In fact, every three nights, I left my avatar immobile for one hour. Pure and simple fun at the same level as mining bitcoins with a cluster of frozen graphics. Although this passive role is fundamental in order to understand the whole system. The game model in L2R, just like with its counterparts, is excessive. Although many of the transactions in the game are done with Adenas (the game’s virtual currency), there are also diamonds, that let you repeat the tasks mentioned more than once among other things. You can get these by paying for them, but you’ll also receive them from time to time as a reward for completing certain missions. But that’s not where it ends…there are also blue and yellow diamonds, gold bricks that let you level up your equipment and experience bonuses for certain areas of the game. You can advance at a good pace in the game without spending a penny, but to keep up, you’ll have to dedicate a good handful of hours or pay money to make the process go faster. The problem with this comes in when the developers are holding endless aces up their sleeves, so you never feel like you’ve reached the high end content the game offers. Just a few months after its release, the game increased its max level from 130 to 180, adding new areas and daily tasks. And this happened again in March this year with an increase up to level 260 and a new level of object rarity over the SR. To avoid discouraging newcomers, it added experience bonuses and objects for low-level players. Nothing is left to chance. So we’re talking about a repetitive subgenre who’s progression is no more than an illusion, and that, at the end of the day, is a way to escape our daily problems, precisely for offering a soft form of gambling and not providing any risks or complications. A few weeks ago, I gave up my position as clan leader and spent a few months completely disconnected because of the crisis of faith I mentioned above in reference to the genre. A few weeks ago, went back like a smoker suffering endless withdrawal, and I’m about to sign off for good. But I don’t regret the time I spent playing. After all, I had some good times alongside friends who were also stuck in the mousetrap. Together, we put together a small glass palace that, for whatever reason, made up for everything in the long run.